Bristol City Football Club has formally submitted plans for a new training ground. 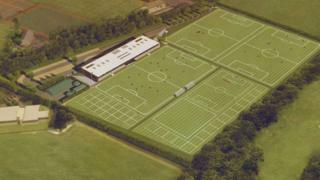 The proposed extension to its base in Failand, north Somerset, includes a 500-seat floodlit show pitch, two full-size pitches and two training areas. City's chief executive officer Mark Ashton said the revamp would provide the club's academy and first team with "an elite performance environment". The new ground will also include a gym and medical facilities. Mr Ashton said: "We've been working on the training ground project for the past two years and, next to the redevelopment of Ashton Gate Stadium, it's the next phase of the club's development and will transform the training environment for players and staff throughout the club." The new facilities will provide a permanent home for the club's first team and academy players and staff. It follows the major redevelopment of the side's main ground at Ashton Gate, which was completed prior to the start of the 2016-17 season.